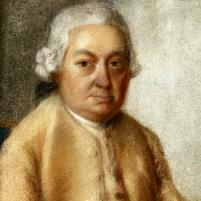 Carl Philipp Emanuel Bach (8 March 1714 - 14 December 1788) - more commonly known as C.P.E. Bach - was a German musician and composer of the early Classical period. The second of eleven sons of Johann Sebastian Bach and Maria Barbara Bach, C.P.E. Bach was born in Weimar on 8th March 1714. He was one of the founders of the Classical style, composing in the Rococo and Classical periods. Through the latter half of the eighteenth century, his reputation was very high.